Pretty Lights is the musical vision of the ultra-versatile Colorado based producer Derek Vincent Smith, accompanied in the live setting by drummer, Adam Deitch. Together these two achieve a raw energy rarely reached in the realm of electronic music. At a time when music lovers from almost all subcultures and genres are finding common ground in the basic form of bangin' beats, Pretty Lights is giving the people what they want; electro organic cutting-edge party rocking beats that fill venues with energy and emotion and send dance floors into frenzies. And the people are responding. 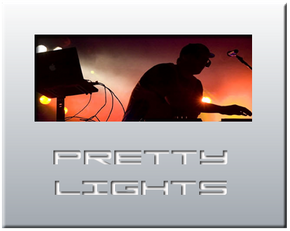 Pretty Lights' six albums, Taking Up Your Precious Time, Filling Up The City Skies, Passing By Behind Your Eyes, Making Up A Changing Mind, Spilling Over Every Side, and Glowing In The Darkest Night have been downloaded over a million times from PrettyLightsMusic.com. A 2009 sold out North American tour propelled Pretty Lights into 2010 with the first tour dates in the UK and Europe and a North America spring/summer tour including stops at Coachella, Glastonbury, SXSW, Outside Lands, Wireless and Ultra Music Festival.